I want an english dub asap for my daughter! I often am sitting through mind numbing disney shows with my 4 year old, and have watched shows through just to see if it would be ok for her. Often I'm left wishing for my precious time back. I'll likely let her watch this anyway and see if she picks up some japanese. Come for the cuteness, stay for the genuineness! Compared to other shows, this one is nothing to sneeze at with it's pretty poor CGI animation. But look past that, and you'll find a truly fantastic series that won't disappoint you. Maybe it's because you don't have any expectations to begin with, or maybe it's just because the show is something that is rarely seen in anime: simplicity. In this world of excess, huge overbearing battles, ridiculously attractive characters with exaggerated features a quirks, and heavy handed drawn out speeches, here you simply have a girl trying to find acceptance in a strange society of anthropomorphic animal girls and her many misadventures. It's cute, warm, and genuine in a way that doesn't have to be exaggerated to stand out. Every character, even with the short time you have with each, is distinguishable and memorable, especially our main characters. If yo stick around past the horrid animation, you will grow to love it's simplistic charm. The biggest surprise and most underrated show of the season. I'll start with the obvious. The animation isn't the best. Some of the voice actors are newbies and you can tell pretty easily, especially in the earlier episodes. It feels like a kid's show at times. There's a mystery going on in the background of this show that everything revolves around. A lot of the content is just these cute animal girls having fun and being silly, but the overarching story is what has kept me engaged with the show. That being said, I have also fallen in love with all the characters and love seeing them have fun just as much as I love trying to piece together the truth behind Kemono Friends. Give the show until episode 4 and see if you still aren't interested. Episode 4 is what made me fall in love with the show, and maybe it will for you too! Ahhhhhh this anime made me so happy. It's funny this anime itself was much like Kaban-Chan. No one expected much... but defied all of our expectations. This was obviously low budget, but they put a lot of heart into this. The creators, Voice Actors, people who made the music. This show had more soul to it then just about anything else we could watch. I'm surprised that This, of all the anime, was not just my fav of the season, but will always be one of my all time favs. At first you might think this show is trash because of the animation but once you keep watching you realize there's a lot more to it. It's cute and extremely funny and while it looks like a kids show there's a lot to enjoy for anyone watching. 5/5 perfect show. Well worth the watch for both children and adults. 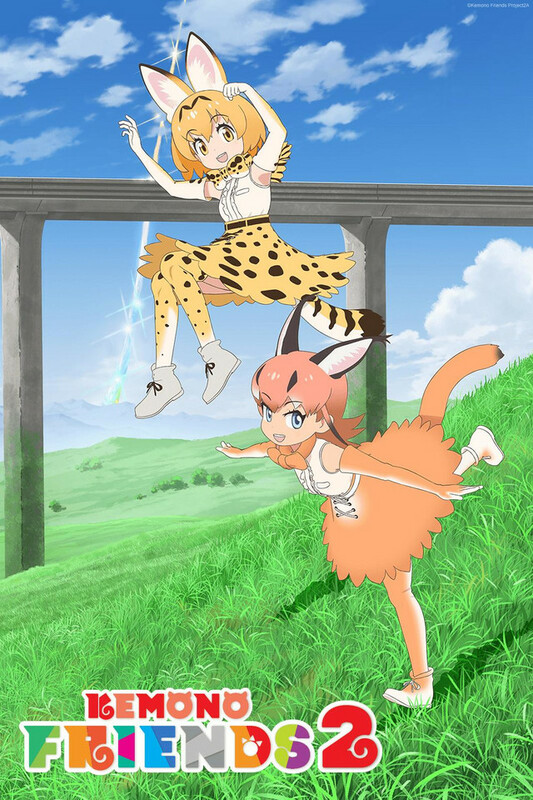 At first Kemono Friends comes off as a budget children's show but as I watched more I found myself strangely enamored.I love the unique quirks of each character.The show also has a deeper mystery that it builds upon as you go deeper into the episodes. Kemono Friends also features an short segment in each episode where they have various professionals give some quick facts about the animal friends featured in each episode. If I had a young child and this show had an English dub I would feel great about having them watch it. It's one of those unique shows that parents can watch along with their kids and still be entertained themselves. If you can look past the shows seemingly low quality animation and somewhat inexperienced voice work you will find Kemono Friends well worth the watch for both children and adults. 1. MAD (Music Anime Douga) videos on Youtube (especially those by 紗霧ください). 2. Origin of the idea when the designer Mine Yoshizaki took a trip to Night Safari in Singapore (the world's first nocturnal wild life park). Too bad the Singapore zoo hasn't hooked up with the series like the Japanese zoos like Kumamoto and Tobu. From what I hear there a lots of fans there too, including Japanese tourist ones. Subtle surprises if you keep watching. This show is based on a smart phone game that went off line about the time it premiered. I guess in spite of the fact there's no game for the anime to promote, everything was already paid for so why not just let it run? Turns out the show is a hit in Japan. Possibly because it avoids some of the usual tropes you see in a lot of anime nowadays(ex: just because it's an all girl cast there's no hints of yuri type romance). Thus making it a nice relaxing change of pace. While it may seem totally like a preschooler show you'd find on early morning Disney or Nickelodeon channels, there are hints of darkness as you keep watching like Adventure Time on the Cartoon Network. One thing that surprised me was this is a full length show not a 5 or 10 minute short. Meaning each episode is a full story instead a story chopped up into small parts where you have to wait until next week to see its completion. Give it a try. This Zootopia like show may charm you. This anime's story is truly wonderful, probably the best one of this year i think. Sometimes you can find some suspense plots in it, which makes me feel the story will become dark like Madoka. But in fact, there is only healing instead of conspiracy. EP2 Human learn to make tools to transform nature. EP3 The invention of text. EP5 Human learn to bulid buildings instead of living in the wild. EP6 Tribes and countries appear.Different regimes fight with each other. EP7 Books appear. Knowledge can be preserved. EP9 Human begin to conquer extreme climate area. EP10 Literature appears. Traveling become popular. EP11 The widespread use of fire. EP12 Human do long distance sailing. With such a fantastic story, no wonder it will be so popular in Japan. It's a game...it's an anime...it's Kemono friends. Not sure if it's my lack of better judgment or my bias towards really cute things, but I was wrong about this show, although it took a while to get used to the animation, getting through the whole thing was definitely worth of my time (not that my time is too valuable anyways). The CGI was very, very bad, after all this is a very low budget production, which to be honest is the only reason why this show is not getting a 5 star rating from me...I was surprised to find what this show was trying to convey. Kemono Friends really has potential for a great video game, never played the actual game from which the anime is derived. The way the plot is built and the story progression are flawless, a simple formula applied to a well developed background story, Japari Park is a beautiful place that's shrouded in mysteries. Friends roam the land, we get to encounter new characters every episode, allowing a wide variety of cute adventures, kinda like going on a safari for the first time without most of the risk involved. Opposed to the popular opinion (which describes the show as "mind numbing"), I was glad to find out that Kemono Friends also offers a very educative experience. The anthropomorphic creatures known as friends are probably the main appeal of the show, but the animal based character design goes further from just aesthetics, the many quirks of these friends and their dialogues constantly reminds us of assorted zoological facts. Interestingly enough, the show intermissions are actual zoology experts commenting on the many animals that inspired the characters. So we have the clever and kinda shy Kaban-chan as the MC, joined by the energetic and loyal Serval cat, both guided by a weird animal-like device known as Boss (often called Lucky Beast). The gang travels the many areas of the Japari Park on a mission to discover the origin of Kaban-chan, the only friend that doesn't seem to resemble any wild animal. From the Savannah, through the jungle, over the mountains, across the desert, by the lake, so on and so forth, the lovable cast is always moving to their next goal, throughout the whole story friends will always be helping each other out. However not everything is fun and games in Japari Park, like I said there's more than meets the eye, there's conflict, a menace and an ominous past, there's so much to discover, so much that I wish to spoiler. I'm still amazed on how this anime betrayed all my expectations, now I'm looking forward for more content. If you can get past the poor animation and lack of resources, you will not be disappointed. Want to continue exploring Japari Park? Continue the story with KEMONO FRIENDS: WELCOME TO JAPARI PARK!